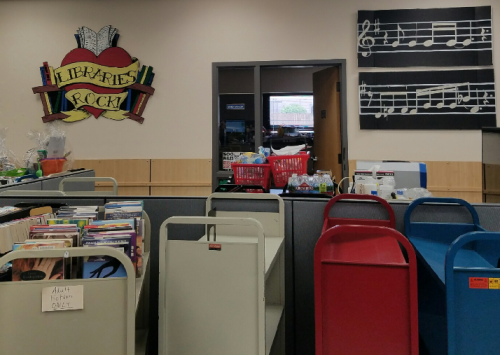 When visitors first enter Esther Bone Memorial Library in Rio Rancho, they are immediately greeted by the larger-than-life decorations created by library clerk Heather Thrower. 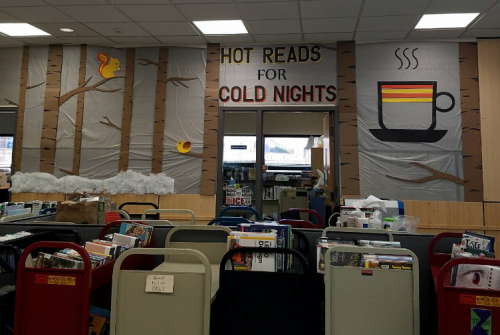 Heather uses her talents to portray the theme of the month on the back wall of the circulation area, creating a fun atmosphere for everyone. 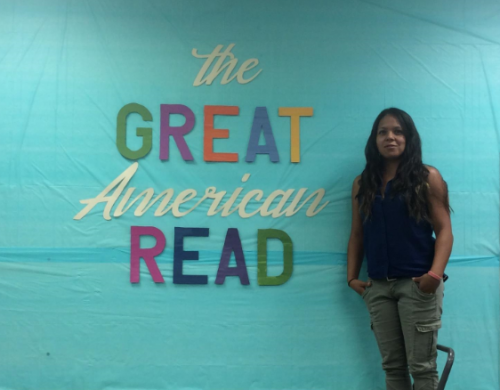 Currently, the wall shows the logo for The Great American Read. Customers frequently comment on Heather’s wonderful artwork. Sometimes Heather comes up with the concept herself, such as a large cauldron bubbling over with googly eyes for Halloween, and sometimes she recreates a theme or logo such as the Libraries Rock theme for the 2018 Summer Reading Program (which was a particularly difficult design). Heather usually uses cardboard, craft paint, and plastic table covers to make her creations. She enlarges her sample or sketch on the photocopier or computer and then sketches the design on a large piece of cardboard. She mixes paints to create the colors she needs. Heather also finds the right font on the computer or uses stencils for simple block letters which she then cuts out with an Exacto knife. It’s always exciting when Heather puts up a new design. And as soon as it does, it’s time to start working on the next idea! Summer Reading 2018, Libraries Rock!